This is the perfect time to plant bulbs for spring flowering. 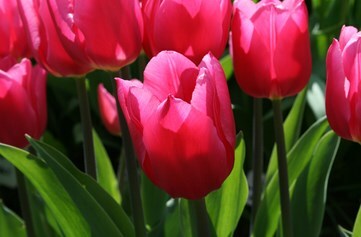 The magazine 'Gardening Which' published a survey proving that you can plant bulbs much later than previously thought. I have planted narcissi and tulips on New Year's Day with success, although they may flower a little later. However, November is the more traditional time, particularly for tulips. Make sure the bulbs are healthy looking, plant fairly close and cover with compost. The image shows my pot planted with tulip bulbs 5" deep, and another layer of early flowering daffodils on top. I also squirrel-proof my pots with chicken wire which I remove in spring. I've planted these gorgeous pink 'Ollioules' tulips which fade to white. Another lovely variety is 'Christmas Marvel'. Happy planting.